Showing results by author "Teleways Radio Productions"
Normally, a last will and testament is a serious, cut-and-dry, black-and-white document. Not so in the case of Strange Wills, Volume 1. So begins the radio show Strange Wills, a mystery-adventure series produced and syndicated by Teleways Radio Productions of Hollywood beginning in 1946. It starred distinguished Hollywood actor Warren William as probate attorney Warren Francis O'Connell, and the stories were told through his eyes as executor of the strange wills made by strange people. Normally, a last will and testament is a serious, cut-and-dry, black-and-white document. Not so in the case of Strange Wills, Volume 2. 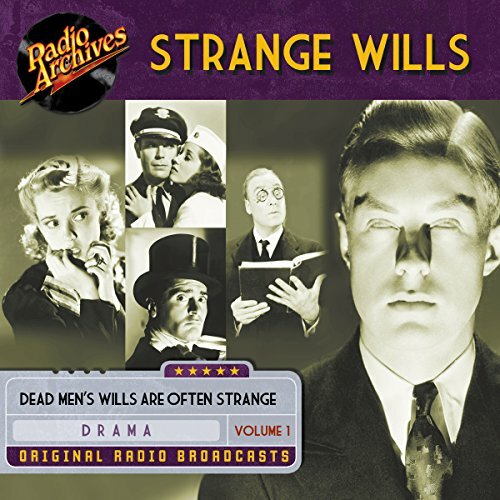 So begins the radio show Strange Wills, a mystery-adventure series produced and syndicated by Teleways Radio Productions of Hollywood beginning in 1946. It starred distinguished Hollywood actor Warren William as probate attorney Warren Francis O'Connell, and the stories were told through his eyes as executor of the strange wills made by strange people.